Produces magnificent spires of deepest maroon, almost black flowers. Hollyhock 'Nigra' is instantly recognisable for its towering spires of flowers which are a deep chocolate-maroon, almost black. A cottage garden favourite, this is a plant that is will bring some classic Victorian style to your planting schemes. The desirable black flowers make this a plant that is always in demand and this is your opportunity to get your hands on them first! The huge flower spikes are loved by butterflies and bees, so by growing them you also help to attract wildlife into your garden. Supplied as an established plant in a 9cm pot, ready for planting out or potting on. 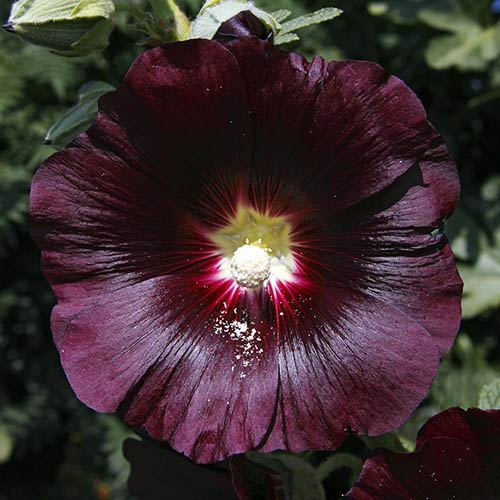 Hollyhock 'Nigra' is a tall, vigorous perennial, with rounded, palm-shaped leaves and their instantly recognisable, towering spires of single, loose trumpet-shaped flowers which are a deep chocolate-maroon, almost black. A cottage garden favourite, this is a plant that is invaluable at the back of the flower border to add height and colour and to bring some classic Victorian style to your planting schemes. The desirable black flowers make this a plant that is always in demand and this is your opportunity to get your hands on them first! The huge flower spikes are produced form early summer from the base of large leaves and are loved by butterflies and bees, so by growing them you also help to attract wildlife into your garden. Supplied as an established plant in a 9cm pot, ready for planting out or potting on, plants will reach around 1.5m (5ft) when in bloom. Note plants are dormant October - March so may show no leaves in the pot. Supplied as an established plant in a 9cm pot, ready for planting out or potting on, plants will reach around 1.5m (5ft) when in bloom. Note plants are dormant October - March so may show no leaves in the pot. Grow in well-drained, moderately fertile soil in full sun. If growing in an exposed location, plants may need staking. A perennial plant, this black hollyhock dies back to ground level over winter, with fresh, new growth emerging in the spring. Remove flowering stems when blooms fade and in autumn cut the plants back to 15cm (6in) from the ground. Before planting, prepare the soil by digging over and removing any weeds. Incorporate some well-rotted manure to enrich the soil if necessary. When planting a number of perennials, arrange them on the surface so you can see how they will look before planting. Individually knock out each plant from its container. Look at the roots – if they are circling around the compost, it is best to tease them out. To do this, push your fingers into the rootball along the bottom edge and pull. Do this in a couple of places. This should encourage the roots to spread into the surrounding soil. Next use a trowel or spade to create a hole just deep and wide enough to set in the rootball. The aim is to bury just the roots, leaving the bases of the stems (when in growth in summer) or the shoots (in spring) above ground. Firm back around the soil, using your hand for small clumps and your heel on larger areas.